maximila is the first German fashion brand for women with a large bust. Everything you will find here from maximila has been specially designed for women with cup sizes from D to K - and will fit your bust! 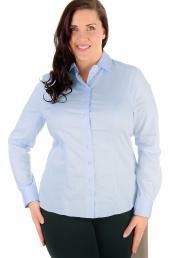 maximila offers high-quality blouses, dresses and tops that will fit women with a large bust perfectly. maximila understands: If you have a large bust, you will not automatically wear large sizes. maximila blouses, dresses and tops are deeper at the bust, but otherwise, correspond to the regular dress sizes - special size instead of oversize! maximila customers are professional women and women who want to be appropriately dressed in every situation. When fashion fits perfectly, women can feel great and be self-confident! maximila blouses and dresses are 100% business-friendly and give you the absolute certainty that nothing gapes or stretches. Feel self-assured and relaxed in their performance - and of course also chic, because maximila's fashion defines your curves instead of hiding them.